A No-Bake Flourless Cake Using Superfoods This is our tried and true carrot cake recipe we commonly make for birthdays or special gatherings. It is a gluten-free flourless cake with no baking required. 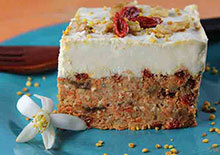 All you'll need is a food processor for the cake ingredients and a blender for the cashew cream cheese frosting. While eating a raw carrot cake might seem a bit odd at first, rest assured it is not at all as unappetizing as it may sound. This particular recipe, we have perfected over the years, offers the best blend of dense cake-like texture and thick, smooth, sweet cheesy frosting.